On Saturday, October 28, a series of terrorist attacks occurred in the Somali capital, Mogadishu. 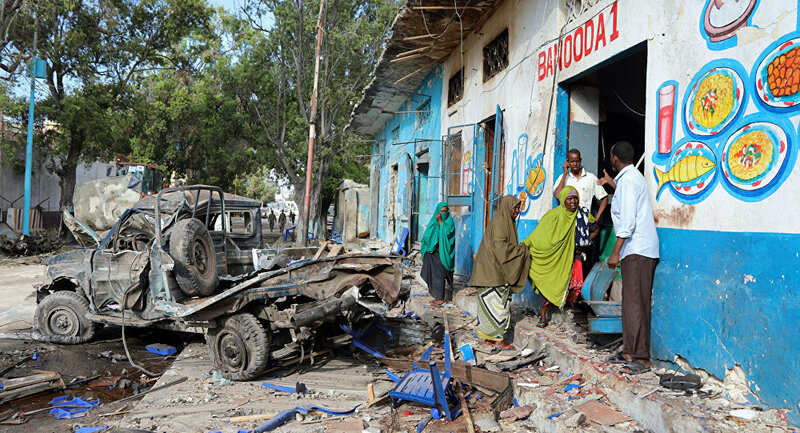 MOSCOW (Sputnik) – The death toll from the attack on a hotel in Somalia's capital Mogadishu has risen to 23; about 30 people have been rescued, media reported Sunday citing police. A security source cited by China's Xinhua news agency said that the police had rescued about 30 people, including a Somalian minister. The source added that many people were killed instantly. Somalian security forces have detained the perpetrators of the deadly attack on a hotel in Somalia's capital of Mogadishu, the country's Information Minister Abdirahman Osman said Sunday. Security forces confirm that 3 out of the 5 terrorists that attacked Nasa Hablod 2 Hotel are in custody. The other two were suicide bombers. — Khyber News (@KhyberNews) 29 октября 2017 г. ​​Many people died because of the shooting, which began immediately after the explosions. On Saturday, a suicide attacker detonated a car bomb near a hotel located close to the presidential palace in Mogadishu. The blast was followed by another explosion close to the incident site. After the attack, a shootout started in the hotel between the attackers and security forces. According to early reports, 10 people were killed and 15 were wounded. — Eyewitness News (@ewnupdates) 29 октября 2017 г. The jihadist fundamentalist group al-Shabab, which has ties to the terrorist network al-Qaeda, claimed responsibility for the act of violence. Terrorist attacks in Somalia are quite common: on October 14, a deadly explosion reverberated outside the Safari hotel, located in the Khodan district of Mogadishu. The blast killed 358 people and injured hundreds more, making it the most deadly in the somber recent history of the war-shattered city.